Unscrew the bubble-wand from the top of the tube filled with bubble solution and gently blow. Hundreds of small, ultra-light bubbles are produced which float about in the air. After ten seconds it is possible to catch the bubbles on your hand or leave them to settle where the majority of them may remain for several hours, some even for days, if undisturbed. A clip attaches the tube to clothing, etc. like a pen. Tube full of super-strong bubble solution. 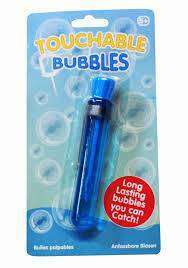 Creates bubbles that can be caught. Colour may vary - picked at random.